The short intermission from Tracy’s helter-skelter world ends and riders re-enter the darkness to find themselves creeping down a hill of Diminishing Squares. This clever stunt is executed with a serious of bang doors that include large painted squares, making their environment seem infinite. As riders literally “diminish” in the corridor, a loud heartbeat can be heard thanks to two large speakers with subwoofers. Near the end of the Diminishing Squares corridor, riders can look up to see Tracy’s famous Outhouse stunt, minus the structure. Although the stunt originally included the walls and a door that mechanically opened and closed, excessive maintenance of the motorized door prompted the dismantling of the Outhouse structure, leaving the skeleton in full view. The remnants of the original Outhouse structure still remain behind the skeleton to this day. Interestingly, the lantern and umbrella in the Outhouse stunt are rumored to be the same props used in the photo on Tracy’s 1968 promotional brochure, and photo comparisons verify that the rumor may be fact. 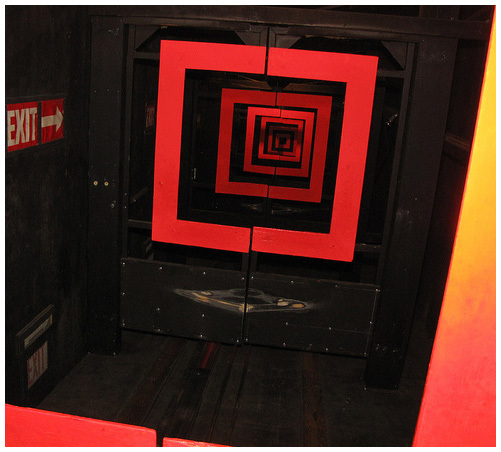 The Diminishing Squares corridor construction is a perfect example of how many of the walls in the ride do not extend to the ceiling, contrary to the perception of the building while riding. Although not visible from a rider’s view, the majority of the ceiling area is open in the ride and is accessible by a catwalk. In case riders haven’t had enough of Tracy’s illusion-based mayhem, they immediately enter the Jumping Room. Destined to throw anyone off track, the Jumping Room is painted with green and red fluorescent stripes on the walls, floor, and ceiling and is accompanied by a bright strobe light and a large mirror on the wall. As Perry Duncan recalls, the Jumping Room originally included two knocker boards in the floor that could violently shake and rattle the cars, but after only a few seasons in operation, the device was made inoperable because it was literally shaking the cars apart. It is a fact that the painted stripes in this room were painted by Bill Tracy himself, and are all original. Leaving the Jumping Room, riders end up in the Tilted Room that includes Tracy’s Wine Cellar. 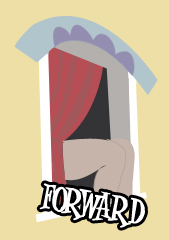 According to Perry Duncan, the Tilted Room was the hardest room to build in the attraction because of its steep angle that is 0 inches at its lowest point and 48 inches at its highest. 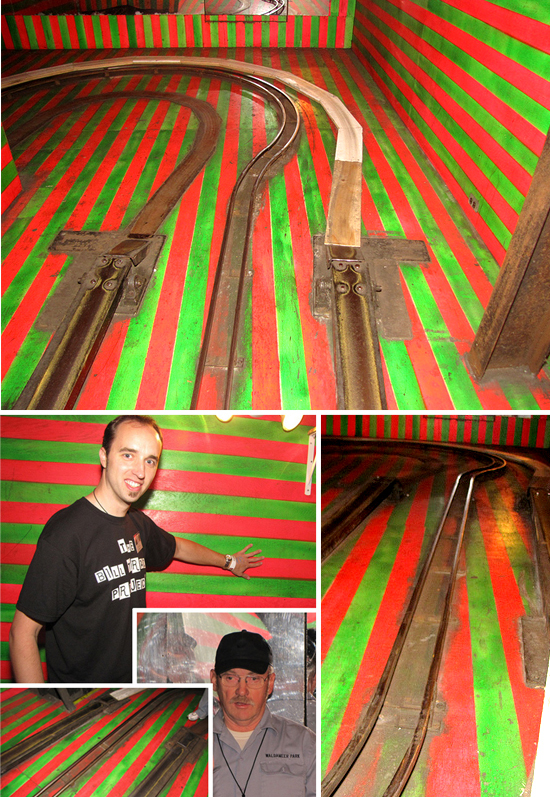 During the winter of 2010, longtime ride operator Randy Skalos refurbished the Wine Cellar stunt after it was vandalized by riders. Randy was able to reassemble the pieces that made up the body and replaced the stunt’s water pump to get it working as it originally did in 1970. Random clapboard and windows adorn the walls in the room and make for an interesting Tracy experience. 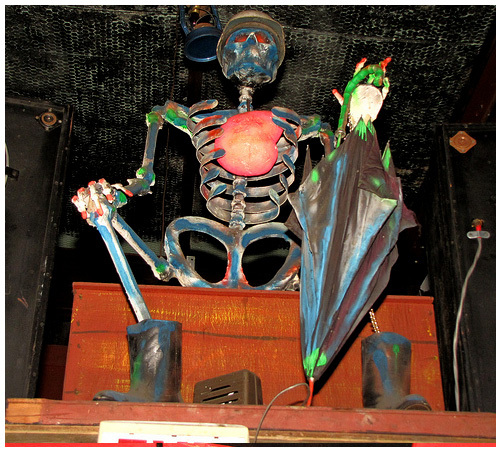 Riders quickly turn right and a light trips on to illuminate what appears to be a 1960s-era bar scene that includes a bartender eager to serve the corpse of a woman! This Tracy original has mostly been untouched since it was originally installed. 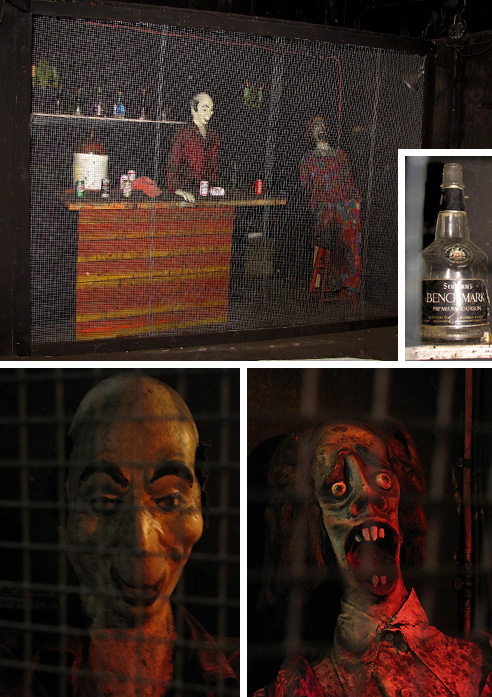 Rumor has it that the empty bottles of bourbon glued to the shelf behind the bartender were actually enjoyed by Tracy during the ride’s installation. 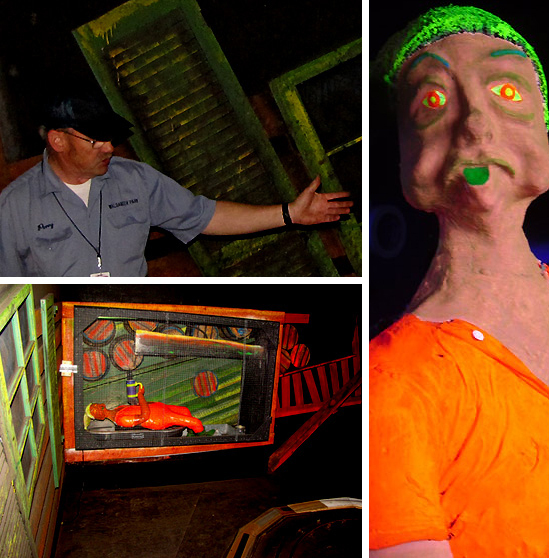 The face mold of the corpse in this scene is the same mold Tracy used for stunts in the park’s Pirate's Cove attraction and its sister Pirate's Cove attraction at Trimper’s Rides in Ocean City, Maryland according to ride operator Randy Skalos. 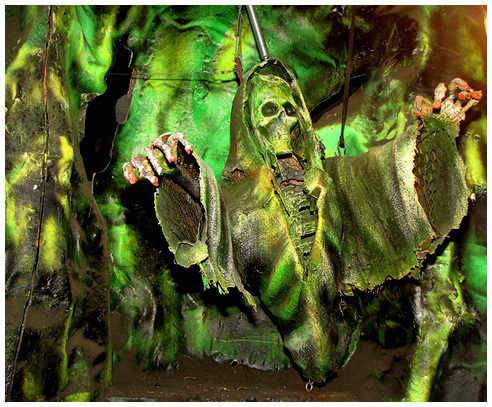 Next up straight ahead is Tracy’s Swamp Ghost surrounded by a rock wall. Similar to the Revolving Barrel installation, the Swamp Ghost rock foliage which was built to be a solid fiberglass piece had to be cut in half to fit inside of the attraction, despite Tracy’s assurance it would fit without any problem. Perry Duncan commented how Tracy, although full of creative and innovative ideas, often failed to think through the logistics and resulted in last-minute plan alterations. 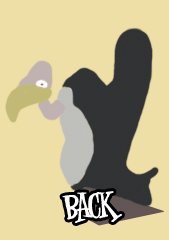 In addition, Perry remembered how Tracy would show up to work on the attraction for a few days, and then disappear for a stretch of time before reappearing to continue work. 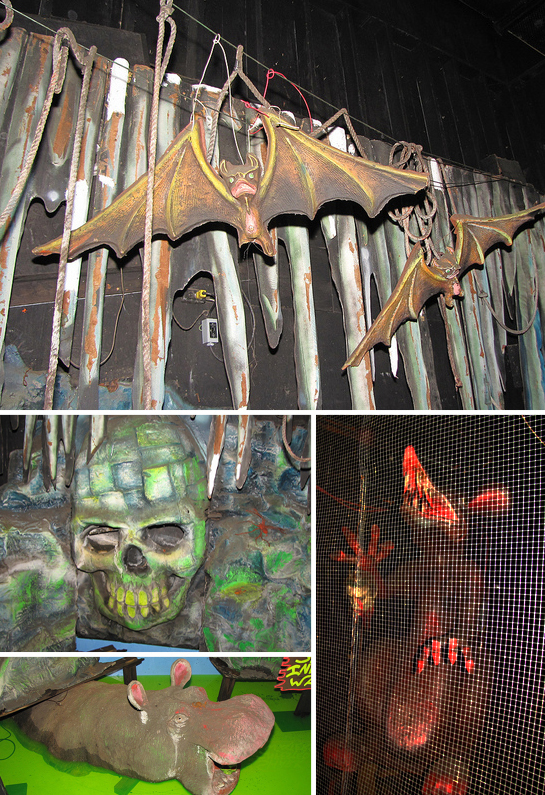 As riders near the end of the attraction, they are forced to experience Tracy’s Skull Cavern. Included in this scene is an original hippo, several Tracy bats, and a recently-added shark prop. A chemical called fluorescein sodium is added to the swamp to make it glow green and has only been used for a few years. As riders pass the swamp, a look to the right offers a glimpse of Tracy’s six-foot Lunging Rat that will make any unsuspecting patron jump with fright. One last surprise! 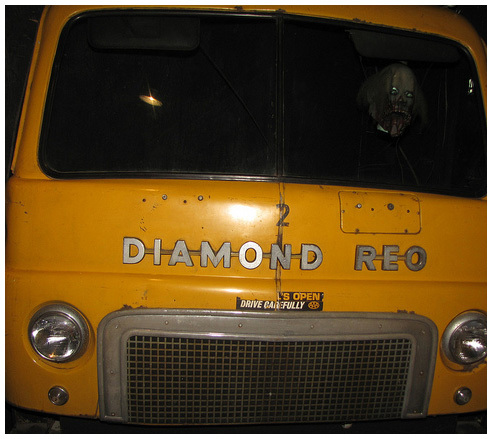 A loud horn sounds and the front end of a Diamond Reo school bus is illuminated to reveal a corpse driver that is apparently adamant about running over his next victim. The light quickly turns off, and riders return to reality as they exit the attraction into the loading area. Originally, a famous Tracy water curtain tricked riders into thinking they were going to get wet, but was removed early on because of malfunctions that caused the riders to actually get drenched!